I have finished my edits on Feast, and am sending the cookbook to my indexer and layout person. No more changes, Mary Anne. I mean it. If you decide you need to add another hundred recipes, please wait another decade or two. 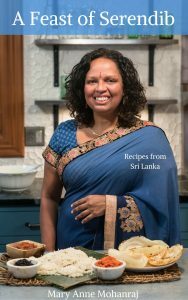 Still planning to bring out more little cookbooks — Instant Pot Sri Lankan, etc., no fear. But this was a big production, as my mother would say. Kickstarter launches April 1st with discounted pre-orders. Mark your calendars!